And there’s something about lying here, eyes closed, listening to the stillness, that I realize just how powerful that lack of noise is. And how I could use a lot more of it. This past week has been a whirlwind of epic proportions. Christmas, traveling, cooking. No matter how non-commercial you try and keep Christmas, the fact is, you can’t show up to parties empty handed. Christmas cards have to be sent. And people expect a token of appreciation, even if it is non-monetary. So that means running around like a bat outta hell trying to get things done. But it is in the silence that I finally am able to breath. Relax. Think. And, with literally nothing else as a distraction, my mind is able to wander. And come to the sobering realization that this is missing from my life. The quiet. The stillness. The moments of no distractions where I can think and pray and listen. I’ve been so restless these past few months about boys and life and career, and I wonder…when was the last time I sat in silence like this? And just think? Not even church is an avenue for contemplation anymore, with its hymns and people watching, and interaction. All well and good – but admittedly, lacking the stillness. God speaks to us in the stillness. As a “gentle whisper.” 1 Kings 19:12. We need to “stop and consider God’s wonders.” Job 37:14. This is not such a simple matter. Being still is not nearly as cut and dry as we may think. Because honestly, when we slow down and be still, we have to sit with ourselves. We have to come face to face with some truths. With who we are. With who we’ve become. And that, can be scary. But I think, it’s a necessity. For growth. For our relationship with God. And our relationship with ourselves. Ohio may be onto something with its silence. With its ability to be quiet. And still. It provides an opportunity to reflect. So for now, I’m going to just shut down the computer and enjoy this respite from the noise and absorb the silence. To sit with my thoughts and prayers and just be. And think about that little Child in the manger. Because He was born on a Silent Night, just like tonight. And I bet if we listen close enough, we may even be able to hear the Heavenly Hosts sing Hallelujah. Hope everyone had a beautiful Christmas. Previous Post Is Christianity Dead? What the Lord said in the Psalms comes to mind: “Be still, and know that I am God.” Wonderful article! Beautiful thoughts and a lovely Christmas epiphany!! Safe travels. Awesome post! Very true. I find silence in the wee hours of the morning. This time is my personal sanctuary. I know what you mean. I need and long for silence. Glad you’re enjoying your visit. I lived my teenage years in Upstate NY and now that I live in Atlanta celebrating Christmas without a white blanket of snow covering as far as the eyes could see didn’t bring that sense of being home. Although Christmas is not about the weather, but about the birth of my Savior. It’s interesting how a snowy Christmas makes the holidays feel so different! As you enjoy the serenity of Ohio remember that verse where we read… “be still and know that I am God”! Beautiful reminder at the end! My husband and I and a friend sit in silence for 30 minutes every Sunday evening. We have done this for 20 years, rarely missing a time. It is a very good start to our weeks. God is always present, of course, but given Him 30 minutes of silence often gives Him room to get a word in! Love this. From the run-up to Christmas to the peace in silence. My favorite post of yours. Thanks for sharing. Where in Ohio? What part? A quiet “God Bless You Caralyn”, enjoy your peaceful time. Shhh.. Happy Saturday, and happy new year! You write so beautifully. Thank you for sharing. Silence is indeed terrifying. I’ve had far too many moments of silence recently and it’s too the point that it became mentally unhealthy. Only because I filled my mind with the problems of my heart rather than the God of my soul. Such a wonderful reminder. Thank you for being a constant source of encouragement. In all honesty, reading your work and getting to know you has inspired me and how I’m going to write in the future. Well put! – the silence can be terrifying… If we share it with the wrong person! Beautiful reflection. I feel you about church. I was fond of my old church that was traditional with a basic choir that was beautiful but much less distracting than the one near me now with a full band. That is the main reason why I moved to small town wyoming. I love the peace and quiet. The city is a fun place to visit, but I’m always in a hurry to get home. Love this post! I fully understand what you mean about the beauty and fierceness of sitting in silence. Sometimes I sigh with relief when I finally pause and process life. Other times, I realize I’ve been hiding in the busyness, afraid of the inner person I’ll see when I stop for too long. Either way, contemplation is a necessity and a gift. Hugs! And happy New Year! You are absolutely right that finding stillness and silence is incredibly difficult – much more difficult than it seems like it *should* be. And it is in the silence that God speaks to us. Even in the midst of the hustle and bustle of the city, I have confidence that you will be able to find moments of peace and stillness. Even on a crowded subway train, it is possible to take a deep breath, let it out, and think just for a second about how everyone in that packed car is connected through our Creator. I also struggle with finding time for peace and quiet. It’s so hard to just *sit* and be still. There is always another chore to do or something else that I can “just take care of really quickly” on my to-do list. Having been transplanted in the opposite direction, from the cities of the Northeast to Ohio, I can definitely appreciate the different pace of life here, but I can still find a balance when I go back to Connecticut and Boston. Sometimes I’m better at practicing mindfulness than others, but I think that’s what it really comes down to. If I can just take a single breath and be mindful, then the next breath is more mindful, and then the next, and finding stillness doesn’t seem like some enormous, overwhelming thing. Anyway, this is apparently another of my rambling comments 🙂 I’m wishing you an abundantly happy New Year and lots of moments of peace and stillness in 2017! Thank you so much!! same to you!! It’s absolutely necessary to sit down with yourselves and reflect. These days, that can feel like the last thing you should be doing, but I find it’s essential to maintaining mental wellness and inner peace. It can go wrong of course. Sometimes you stumble across inner conflicts and turmoil that ruin your whole day. But we have to face these conflicts or else they seep into our entire lives. There is an old 1967 hit, by Brian Poole and The Tremeloes called ‘Silence Is Golden”..
You too, and listen to Brian Poole! Same for you. We know how those people can be down there. Don’t take no bull!! Very beautifully said. Silence is getting harder and harder to find. I feel closest to God when I can get out in nature and soak in the serene beauty that He has created. If only I could do that more often and get away from the noise. Thanks for sharing! God bless you in the new year. I really enjoyed your post! I feel like I need time to reflect everyday to be able to have a relationship with God. I call it my one-on-one time with God. To dig into His word and just focus on Him before I start my day. I find this to help me start my day on the right foot and to remember to be patient with others and kind to others even when they may not deserve it. I like the part where you mention that silence is not always a bad thing. We need that every now and then to bring us back to a place of calm. Thank you again for sharing your thoughts and being open as well! It is cool to find others who are like minded in this way! Silence and stillness really has come to me as important this last year. The realization that true silence is not just absence of sound, and stillness is not absence of movement. And how worthwhile it is to actually silence ones mind to see and feel what’s beneath! Yes. I am desperate for silence right now. (With a house full of kids home for the holidays and all that entails, my quiet time gets squished out… and I am feelin’ it!!!) I ache for quiet. I crave the silence and space that I need to really connect with Jesus on a deep level. Thanks for this great reminder… I’ll try hard to find a quiet corner in the next few days…. 🙂 Blessings. “Be Still” was my motto for all of 2016! Its amazing what you can hear when you are “still” in His presence or in life in general! Enjoy the quiet and have an amazing new year when it comes! That would be a nightmare for me. living in Meridian, Idaho (suburb of Boise), my little neighborhood is very quiet at night. Over a year ago, I attended a conference in Portland and my hotel room faced the street and yes, it was noisy. I barely slept at night. Coffee was my friend during the day. I had my big city adventures when I was young (lived in San Francisco), but now that I’m a cranky old man, I like it peaceful and still. This was beautiful and resonated with me today. Thanks! Inspiring! 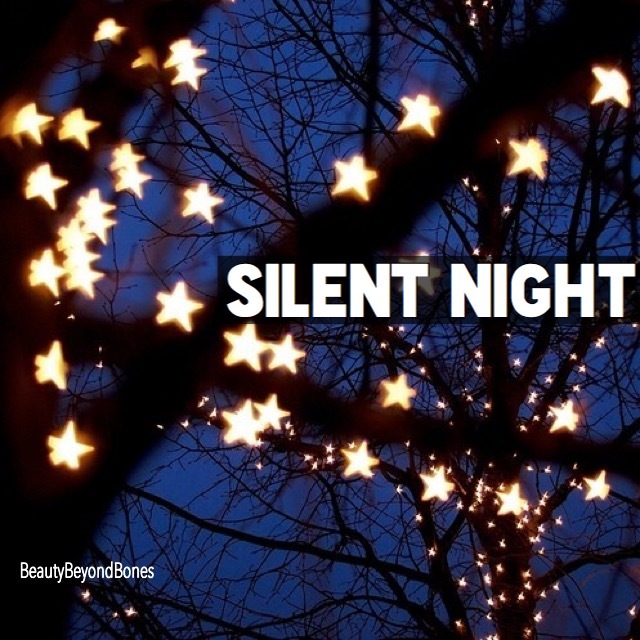 Sometimes,only in silent night that we can hear things that our ears cannot hear and our eyes cannot see. May you be blessed more this new year! 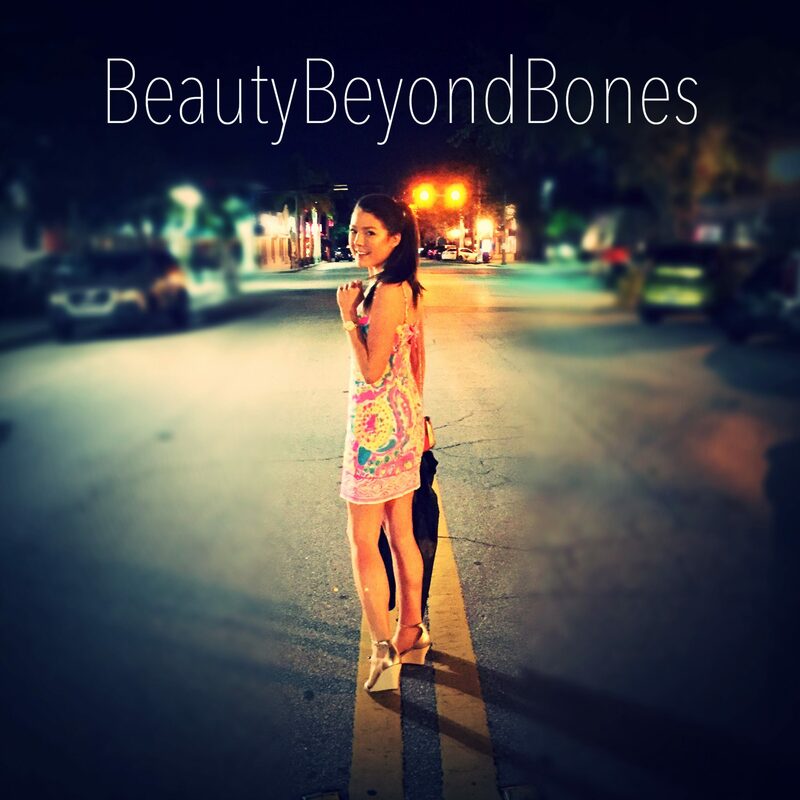 I can see not only beauty beyond bones but mostly the beauty beyond your heart…God Bless! I can never have enough quiet. I drive my husband crazy! He has to have noise. lol! I live in a rural part, winter is the quietest time of the year and I love it! I wait all summer for my hush hush winter, when you can hear the snowflakes fall. Your thoughts are so soft and beautiful. I hope you find the quiet you are looking for in Ohio. I read a book by John Ortberg a year ago. He said one of the hardest things for us to do is sit in silence but it is very crucial. We need to do it often. Thanks for the reminder. Reblogged this on James E. Woods. Finding stillness and quiet is difficult in our always on world. We recently house sat out in the country. So quiet. Almost “there is a murdered coming to get you in the night” quiet. Fortunately, we survived. Your post made me think of Paul Miller’s book, “A Praying Life: Connecting With God in a Distracting World.” Have you read it? ^This line got to me. So very true. Sometimes that’s what makes silence so scary. Silence is hard where every bit of your attention is demanded elsewhere. Many pay good money to learn to sit alone with themselves. So, accept that gift wherever you may find it. There are many times when I don’t when others do because I’m, fine. I don’t know a better word for it. Hi Caralyn. My friend helped create Current/Elliot, it’s a fancy LA brand. Among some others but, he was falling apart and LA will turn on you, haha. So, he bought a piano and moved to a small town in PA. He only sells a few songs a year to survive. I think artists need that, quiet. To find their their way maybe. This post reminded me of that. He’s happy. That’s pretty neat you could hear the subway through the floor. It’s a nice picture of you also. Haha. 🙂 You have a pretty neat life. Do you think people just choose escapism over silence because of the fear of knowing yourself? I know, when I work long hours it is when I don’t feel connected that I have to call it a day. I noticed that’s when other people even escape that through their devices and stream shows or drink. I read and draw, I don’t know who has it right really my love of old ideas or trusting the hive mind of popular culture. Thanks. I’m the same in real life. Yeah silence is golden and freaky. I’ll probably always have to use ambient noise to fall asleep. But as you say silence is important. There’s a reason why it’s a spiritual discipline. Not speaking can have a similar effect. An interesting experience for Lent would be only speaking when absolutely necessary or when spoken to or something. Can you see all the stars where you are in Ohio? That’s the other thing about leaving the city: Stars. I love being able to actually see the Milky Way. Silence and stars sounds very purifying and relaxing. Hey Aaron! Oh gosh, yes the stars are such an awesome part of Ohio too. Sometimes, living in the city, I forget they’re up there! Haha they definitely speak to the splendor of God! Big hugs and happy 2017! Silence is indeed very important. I’m so happy the city I live in has parks! Best wishes and have a happy new year! Have a Happy, Healthy and Prosperous New Year. Thanks for the likes. I’m very happy you found a place of peace, and enjoying it. My best wishes for you in the New Year. Let it bring you all good, blessings, love, and good luck. Thanks. Very profound. Yes. Definitely God can minister to one’s soul in the silence. In silence, one can experience the presence of God. In silence, one’s questions can be answered and new questions can be raised. In silence, direction can be discovered. In silence, the balm that heals mental, emotional, and physical ailments pours forth and one can embrace the peace that passes all understanding. Silence is powerful in so many ways that it can’t be explained in just few lines. I’m glad you found it and you are making the most out of it. Happy new year! Well said. My mom always told me, “Silence is golden.” To which I could only add, enjoy it every chance you get. I had some of the exact same thoughts this past week, visiting family in rural Ohio. The silence was needed, but somewhat unsettling, haha. If there’s one thing I learned from my years in New York City, it was that silence can’t be an end unto itself. Sometimes in the City, I didn’t have that option (obviously). But at the same time, I had the most peace-filled moments of my life amidst the chaos of the city. If I am able to treat silence as a way to posture myself to listen to God, I’ve found that He is there… just waiting for me to finally acknowledge Him. Thanks for this post! Yaaassss I love this so much. What a powerful testimony and great analogies. Nice post. I like the phrase, “we have to sit with ourselves”. Very important to sit with ourselves and realize who we have become and if that is okay. Self-examiniation is indeed a very important part of being a Christian. My husband and I went back to Ohio for Christmas as well and said the exact same thing. The quiet was startling (which sounds like an oxymoron, but I know you understand!). From the hustle and bustle of California, the quiet felt like such a needed respite. Like time was moving slower, and we finally had time to catch our breaths. I relate so well to this post. Moving into this year, I want to be more intentional about sitting in the quiet listening for God’s voice. Thank you for sharing, Caralyn. <3 Wishing you big blessings in this new year! I live in Cleveland – not much quiet here. Plus, I have a gang of children whobare on winter break! I find that late nights and early mornings are ideal for real quiet time. I sacrifice a bit of sleep just to have space to think. I remember going “camping” at the cabins in Pymatuning and Salt Fork as a kid. I wish I could go back and enjoy the beauty of just being. I hope you enjoyed your visit, and are able to find quiet moments even in NYC. Ok gosh yeah Cleveland is pretty noisy! Oh those camping trips sounds idyllic. Thanks for stopping by! Thank you for sharing. This is how I felt leading up to Christmas, which saddens me as I couldn’t get myself to sit in silence, to take in the serenity of our calming natural surroundings and to just breath. I felt overwhelmed and lost to be honest.